JANG Joon-hwan’s already star-studded thriller 1987 has added more faces ahead of its April production start. 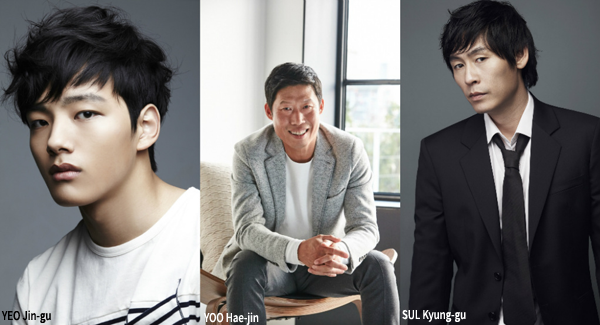 Joining previously announced leads KIM Yun-seok, HA Jung-woo, GANG Dong-won and KIM Tae-ri are YOO Hae-jin, YEO Jin-gu and SUL Kyung-gu. Both KIM Yun-seok and YEO Jin-gu previously collaborated on JANG’s last film Hwayi: A Monster Boy (2013). Taking place in 1987, the film deals with the real life events surrounding the death of student activist PARK Jong-chul following his torture by the police. The state seeks to bury the incident but other students and the media attempt to uncover the truth. YOO Hae-jin has been on a run of hits, which have included Veteran (2015), LUCK-KEY (2016) and Confidential Assignment. Young idol star YEO Jin-gu, who will take on the role of the student activist, has recently been seen in The Long Way Home (2015) and is next on screens in June in the period action drama The Proxy Soldiers. SUL’s most recent credit was in the sci-fi thriller Lucid Dream, which was recently purchased for global distribution by Netflix. 1987 is the third film by director JANG, who debuted with Save the Green Planet in 2003, which became a cult classic and one of the most famous Korean films abroad. Already one of next year’s most anticipated features, 1987 is being financed and distributed by CJ Entertainment, which was also behind JANG’s debut.